The women’s hockey team—under Landry Family head coach Katey Stone for the twentieth season—finished 27-6-3: a tremendous year marked by the Beanpot championship, Ivy League title (8-2), and the Eastern College Athletic Conference season and tournament titles (the former, tied with Clarkson; the latter, a 7-3 win over Cornell). Having reached the NCAA national championship game, the Crimson fell 4-1 to Minnesota in the Gophers’ home arena on March 22. Seniors Hillary Crowe, Sarah Edney, Lyndsey Fry, Marissa Gedman, Michelle Picard, Josephine Pucci, and Samantha Reber depart with a 97-29-11 record. But junior goalkeeper Emerance Maschmeyer returns, as do offensive powerhouses Mary Parker, Miye D’Oench (both juniors), Sydney Daniels (a sophomore), and Lexie Laing (a freshman): four of the five team leaders in points. The men’s hockey squad, for the most part healthier this year than in past campaigns, finished 21-13-3. The Crimson swept Brown in two games in first-round ECAC tournament competition, and then dramatically defeated Yale in the second round by taking the third game in double overtime, 3-2. Subsequent victories over Quinnipiac and Colgate at Lake Placid earned the Crimson the championship, and its first NCAA tournament appearance since 2006, with a three seed in the Midwest region. But the postseason was a one-and-done affair: Harvard fell to Nebraska-Omaha, 4-1, in its first-round Midwest Regional contest at South Bend, Indiana. Fittingly, the Crimson’s goal was scored by junior Jimmy Vesey, the ECAC Player of the Year, who entered the game with 31 goals, leading the nation. 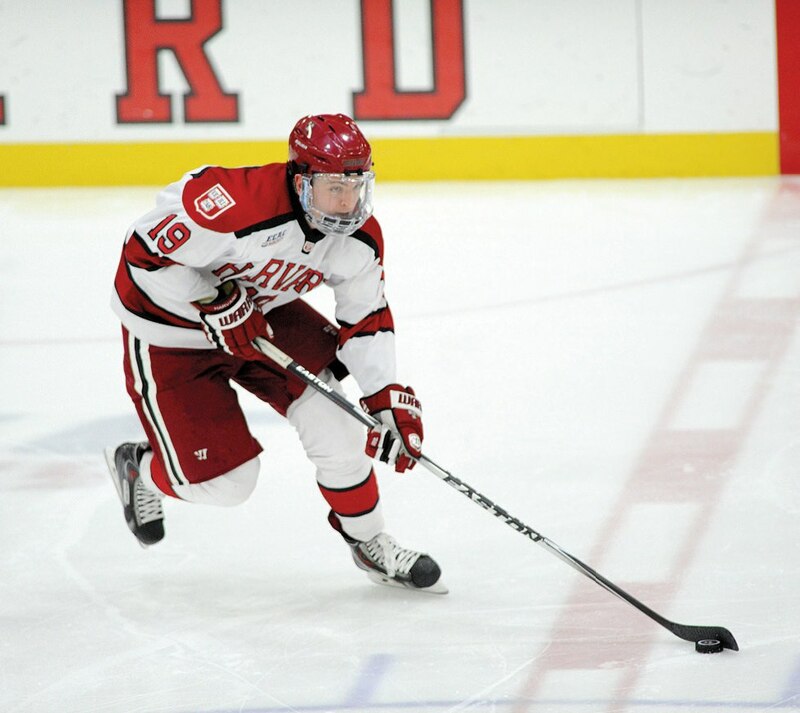 A finalist for the Hobey Baker Award, conferred on the top NCAA men’s ice hockey player (the decision was scheduled for April 10, after this issue went to press), Vesey, drafted by the Nashville Predators, decided to return for his senior year—a big boost for the Crimson in 2015-16. Senior goaltender Steve Michalek set the Harvard record for saves in a season, finishing with 1,029.